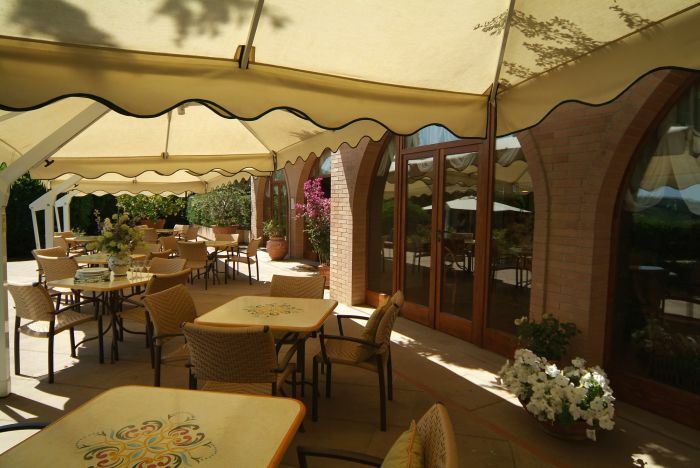 The Relais Santa Chiara is a charming and elegant four star hotel located just 400 meters below the city walls, a short walk from the medieval hill town of San Gimignano which is characterized by its magestic towers. Situated on a hill the heart of the rolling hills of Tuscany, right between Florence and Siena, and overlooking the splendid, serene Tuscan countryside towards Volterra, the hotel offers impeccable service and surroundings, maintaining the taste and style that attracts visitors from all around the world. San Gimignano, a town of fairy tales with its 14 medieval towers that testify to a fascinating past, offers many must see visits like the Palazzo del Popolo, Palazzo Nuovo del Podestà, Museo Civico, Cortile del Sodoma, Sala di Dante, Basilica Collegiata and Chiesa di San Agostino. 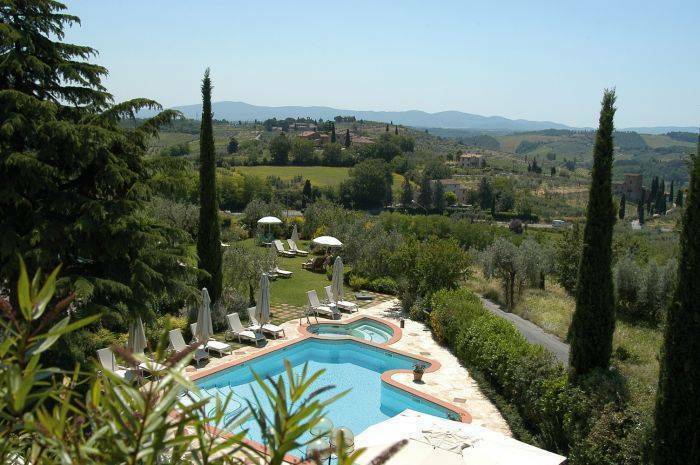 In addition, the strategic location, central of the Relais Santa Chiara and San Gimignano allows one to make day trips and to easily reach and enjoy all of the natural, historical, cultural, artistic and gastronomical delights of Tuscany and Central Italy. The hotel offers 41 rooms and suites, spacious lobby and lounge areas, naturally lighted meeting room, cocktail bar that serves an array of beverages and a variety of snacks and typical light lunches, breakfast room that serves a complete buffet that will certainly satisfy the biggest morning appetite, free form swimming-pool with heated mini pool with hydro massage, Mediterranean garden with cushioned sun beds, umbrellas and pool towels, shaded terrace for al fresco dining and private parking with the possibility to reserve secured parking. The guest rooms provide the amenities one expects from a first class hotel with 24 hour air conditioning, satellite T. V. with multi-lingual programming, in-room digital music, direct dial telephone, mini-bar and hair dryer. Particular attention has been given to the hotels furnishings. Some of the most prestige materials make up the guest rooms, such as brier wood and national oak. Also included are features like wool carpeting, wooden hangers, fine cotton linens and fluffy bath towels. 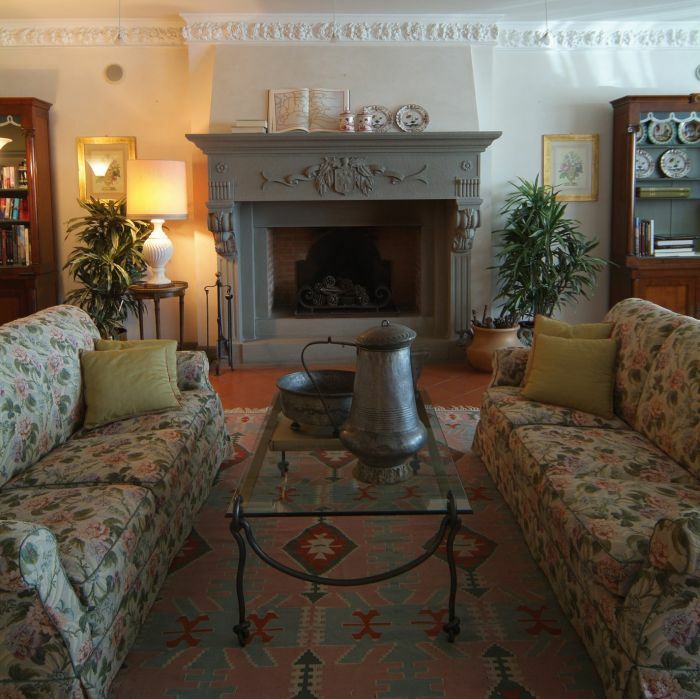 All rooms at the Relais Santa Chiara have private facilities with bath and/or shower. Our Doubles have one double bed, 140cm wide and 200cm long. All Doubles have a nice balcony. These rooms serve also as our single rooms. Twin rooms are our standard rooms with 2 separate beds, but can also be made up as 1 large (king-size) bed. Please specify in your reservation request. All rooms have have private facilities with bath or shower. 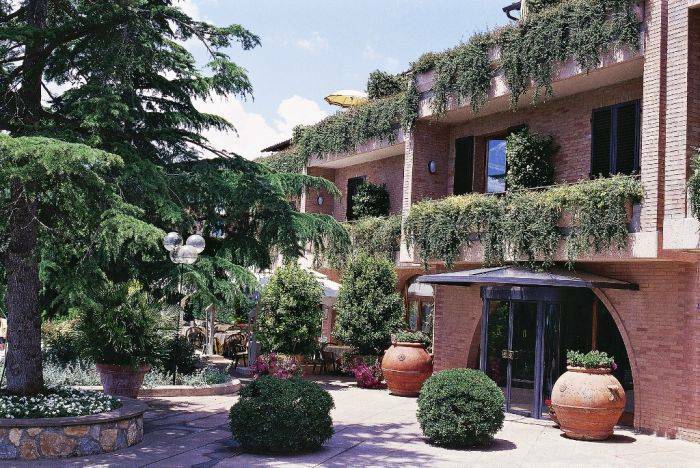 The hotel is located in a residential area 400 meters below the city walls, a short walk from the medieval hill town of San Gimignano. In order to confirm your reservation, we require your credit card number with expiry date, which we hold only as a guarantee. Payment is on departure. Our cancellation policy requires 5 days advance notice of eventual cancellation to avoid a charge of all nights in bed & breakfast. From Pisa airport take the Superstrada FI-PI-LI in direction of Florence and exit at Empoli Ovest, SS 429, in direction of Siena. At the town of Certaldo take direction for San Gimignano, 12 km. Go along the wall of the town to the opposite side. Just past the gardens on the left, turn right on Via Roma, then right again after 150 meters in Via Matteotti. From Florence airport take Autostrada A1 in direction of Roma and exit at Firenze Certosa. Enter Superstrada FI-SI in direction of Siena and exit at Poggibonsi Nord. Following the arrow indications for San Gimignano, up the hill for 13 km. From Rome take the Autostrada A1 in direction of Florence and exit at Siena/Bettole/Sinalunga. Follow arrow signs for Siena, SS 326, then arrow signs for Florence on the Superstrada FI-SI. Exit at Poggibonsi Nord. From Poggibonsi follow the arrow signs to San Gimignano. Just a few hundred meters before San Gimignano, you will arrive at a large round a bout. From there continue straight towards the town, then left on Via Matteotti after 70 metres. 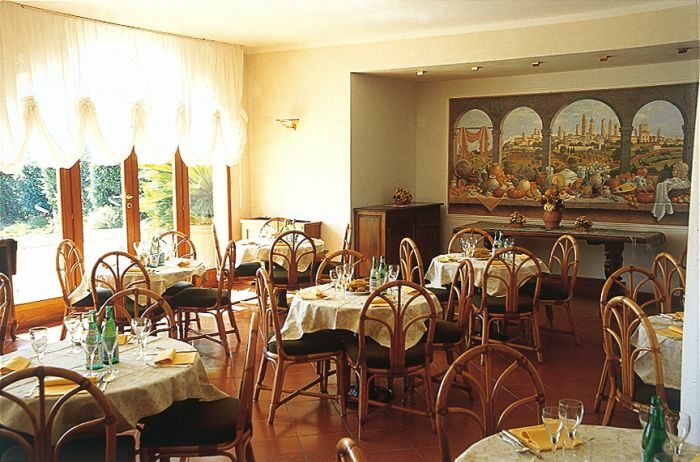 The hotel is located 450 meters south of the historic centre, Porta San Giovanni. Around the town there are large beige signs to help direct you. Clients may check in and unload luggage inside the gate of the hotel. There are 8 parking spaces inside the gate for a nightly charge. There is other limited free parking on hotel property. When full, some cars must park on the road 70 meters away. It is safe.